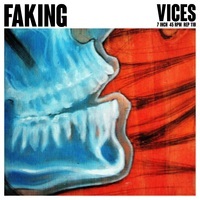 Ruthless and machine stamped from the same kind of sonic foundry that used to produce menacing flyover state noise rock, Philly’s Faking certainly ain’t faking it here on their debut 7”. The A and B sides are an alloy of the rudest abrasive mathy angularity found in the nineties Amrep and Touch & Go camps, harkening back to an era of uncorrupted sonic battery. And Faking does it without the self-conscious sneer of retro-scene boot-licking – these men know the world of which they speak, this trio having been assembled out of the wreckage of seminal PA noise rock bands Gunna Vahm and Midiron Blast Shaft (both Reptilian alums). The crunchy buzz saw riffs hammer down with calculated repetition and bleed into reverb drenched seasick leads. The vocals invoke threat, like a crime scene report read aloud long after an urgent warning wasn’t received. Thunderous rolling bass. Truly massive drums. The right kind of nastiness for the wrong kind of people. Full length album due in 2015. Vinyl purchase comes with immediate Digital Download in your choice of modern formats!